When the rabbit thief steals one of your best rabbits, the only response is to buy three more. 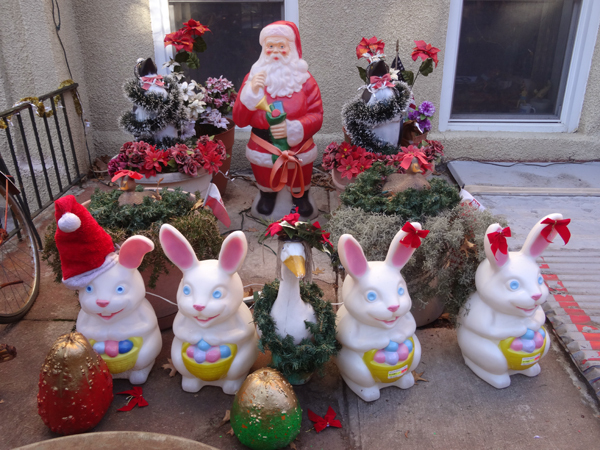 I dare you rabbit thief – try to ruin Christmas, Easter, Valentines Day, Halloween and sometimes Presidents Day by stealing rabbits. For each one you steal, three more will come back even more adorably. Do your worst! *applause* I like the paint job you did to the pumpkins, by the way. For Easter you should paint them like Easter eggs. I wanted to let you know another rabbit has arrived on his own, to my surprise. He has introduced himself as potentially an outstanding new addition to the team. Now there are five. The rabbit thief will never win. This may be the new way to communicate with neighbors: leaving notes and lawn ornaments in each other’s yards. Good thing he’s from Illinois. I trust you read about the syphilitic Gowanus rabbits, yes? Amazing. Brooklyn is the best!